The Chicago Blackhawks team motto is ‘one goal’, and thankfully for the Vancouver Canucks, that’s all the Blackhawks got in Game Five. Game Six will have to be similar if the Vancouver Canucks are to realize their goal of forcing a decisive Game Seven back in Chicago on Thursday night. For the Canucks, they will likely be without Sami Salo and will have to insert Laurence Nycholat into the lineup. Nycholat is a veteran but has not played much for the Canucks this year. With Salo and Mitchell out, the Canucks blue line will have to be especially sharp and need continued strong contributions from the likes of Christian Ehrhoff, Kevin Bieksa, Alexander Edler, and the bottom three, Shane O’Brien, Laurence Nycholat and Andrew Alberts. The Canucks will have to contain a Chicago attack that has scored 11 goals in two games in Vancouver this post-season. On a more personal level, Roberto Luongo will be looking for exorcise the demons from last year’s game six, where Patrick Kane lit him up for a hat-trick en route to a seven goal trouncing of Vancouver, leading to the now infamous ‘7uongo’ nickname for Roberto. Sunday night, the Canucks played a disciplined game that delivered a balanced attack and steady defensive play. They protected their goaltender by crowding the front of the net and ensuring that as many loose pucks as possible were swallowed up by Canucks defenders. The Canucks are only 2-3 at home this post-season and will need to ensure their special teams are also up to par if they hope to even their home record and the series at three games apiece. The Canucks will likely offer a similar lineup to Game Five with the Sedins playing alongside Alexandre Burrows. Burrows was especially effective last game as he curtailed his penchant for taking undisciplined penalties and instead focused on driving Antti Niemi nuts in front of the Chicago goal, screening him perfectly on two of Vancouver’s first three goals before potting the empty netter himself. The twins meanwhile have been steady and continue to pick up some points, but it would definitely do the Canucks a huge service to have them play their best and record a couple of points tonight. The Canucks second line will likely remain the same, with Ryan Kesler skating between Pavol Demitra and Mason Raymond. Demitra has struggled in this series, but Mason Raymond and Ryan Kesler have been solid. 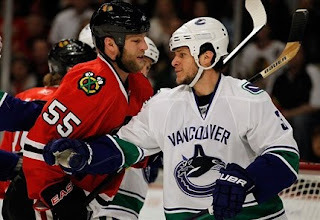 Raymond especially has been strong, while Kesler has shown good determination even if he has yet to hit the scoresheet. Those two will also be important when it comes to the penalty kill – which must remain air tight. Kyle Wellwood will have Michael Grabner and Mikael Samuelsson on his flanks on a line that caused the Blackhawks a lot of problems. Wellwood has been a revelation yet again this post-season, winning faceoffs, being responsible defensively, drawing penalties and scoring goals. Grabner has also looked very dangerous and the Canucks would love to have a solid game from Mikael Samuelsson as well. The Canucks fourth line will likely consist of Jannik Hansen, Steve Bernier and Ryan Johnson. This group has also proven to be rather steady, though not as exciting. Johnson and Hansen will be key on the penalty kill and in a defensive role, while Bernier may likely get some time in front of the Chicago goal on the power play. Tonight’s game should be very interesting as the Canucks’ season is once again on the line, this time on home ice. They should come out inspired and play a strong game. On the other hand, the Blackhawks have responded after poor games in the past, including in this series, and will also likely be on form. Will the Blackhawks make the necessary adjustments and will the Canucks keep their composure? NOTE: Chicago has apparently packed for the weekend, planning on flying from Vancouver to San Jose. Will this news item perhaps be pinned in the Canucks dressing room? Canucks better stay out of the box! Hope the refs don't screw them also!